Want to push yourself? Get faster, stronger, both? Try a brick workout – that mixes short distance (200 run, 1,000 bike or 50 meter swim) in chunks of 5. Repeat 4-5 times, keep your recovery short and watch your swim/bike/run/row raced sore. Here’s an example from tonight with some cool friends (see pic below). This one mixed some strength too (kettle bell). Kept clock rolling. 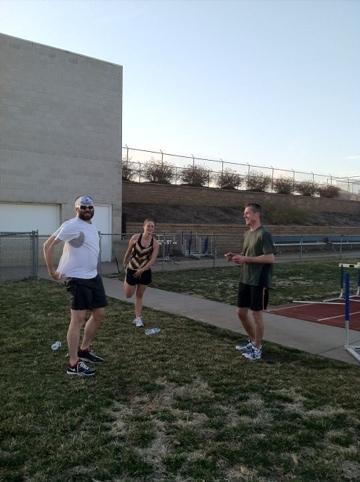 1/3 mile warm up w/ Heidi/ 1/4 w/ Freaky Fast gang Sherri PJ, Lissa and Tim. 4 bricks of 5- 200’s with rest = time for 200 x 1.2 to 1.5 (so a short rest). 25 kettle bell swings and squats to warm up (25# kb). Brick 1: 39, 42, 43, 45, 42. 15 kb swings. 3 minutes rest. Brick 2: 39. 42, 43 44, 42. 15 squats, Brick 3: 38, 41,39, 42, 39 4 min rest; Brick 4: 38, 40, 41, 41, 39. Brick 3 and 4 were fastest. 4k (2.48 m) – in 14minutes 6 seconds (5:41 mile pace). Jogged/walked 2 lap recovery. Last lap included KB – 10 curls (l/r), 10 side bends, 10 tri ext, 25 figure 8’s. (145 tot strength).